The first time I saw the car, I was rather puzzled. Maybe even a little disappointed. There I was, hoping to see an Abarth badged car with a fancy colour scheme and those hot Abarth wheels. But I found myself looking at what seemed like a bare bone Fiat Avventura without the spare tyre on the tailgate and a ton of Raid de Himalaya stickers. 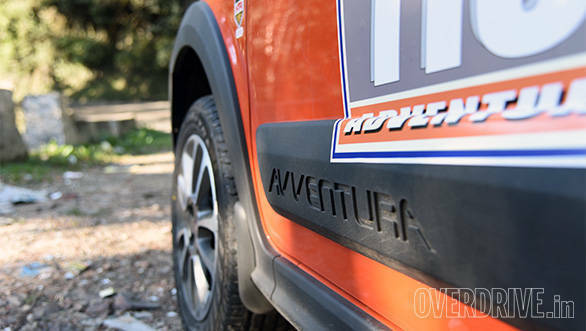 That's right, the Fiat Avventura Abarth isn't making its first impressions at a racetrack near you. 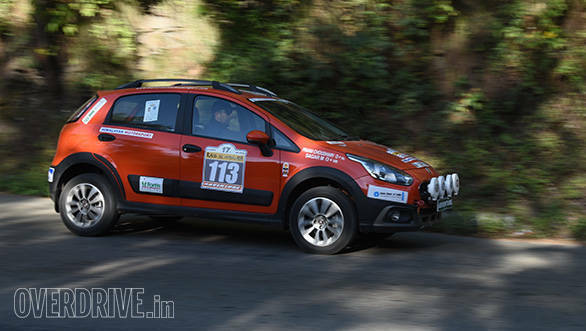 Instead, it is took part in the 2015 Raid de Himalaya to prove its mettle. Although the car looks the same cosmetically, all the relevant changes lie under the hood. When you settle in, the first thing you notice is how much lighter the clutch is in comparison to the one on the standard car. 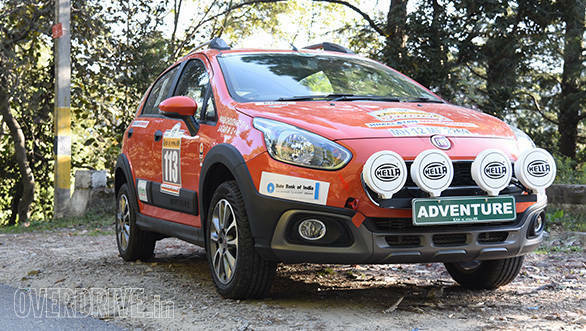 After driving around the city for a couple of days in a Fiat Punto Evo, and grumbling about a less than cooperating gearbox and clutch, the Fiat Avventura Abarth felt much better. The 5-speed manual gearbox on the Avventura Abarth, however, was still rubbery, and feels like the same unit on the regular Avventura. The next thing you notice is how much quicker the 140PS/210Nm engine revs when compared to the standard 1.4-litre 92PS engine. This engine has been imported and is a detuned version of the one used in the Abarth 595 Competizione. The rev counter surges to the redline pretty quickly after the turbo kicks in at around 2,000rpm. Although there is a hint of lag, the boost is delivered in a manner that doesn't unsettle you - smooth and linear. Put your foot down, and you'll be doing close to 100kmph without even realising it. 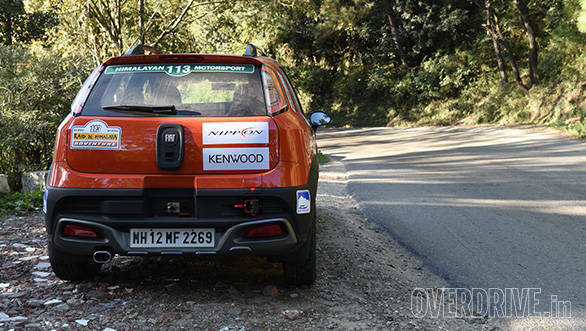 The Avventura Abarth managed to pull uphill with ease despite two people in the front and an abundance of 'Raid essentials' in the rear passenger area and boot. 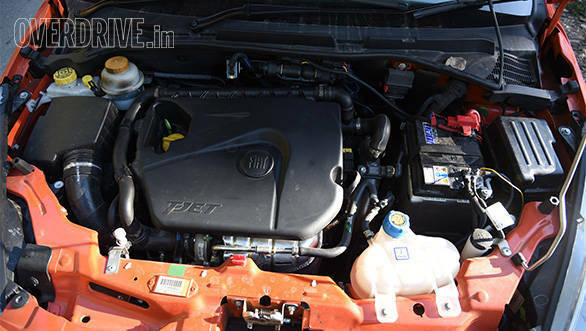 Fiat claims a 0-100kmph time of 9.9s, which is good, but a little disappointing considering the fact that that a Volkswagen Polo GT TSI manages the same in 10.4s using a 105PS 1.2-litre turbo petrol. Around the bends, the car stuck like it was glued to the road despite nudging it around every now and then. 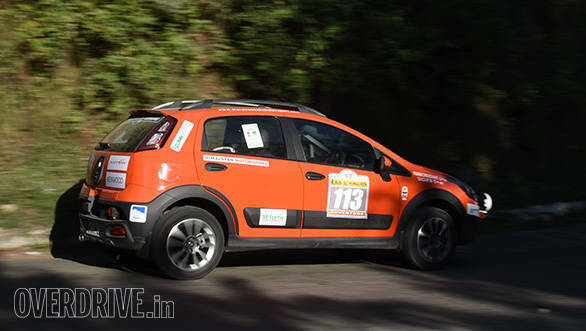 The suspension on this Avventura Abarth had been stiffened to tackle the Raid, which possibly attributed to its improved handling and bumpy ride. The steering was precise and felt light in a not-too-twitchy way, and although it did lack a little feel, it's one of those trivialities that you barely notice because you're simply having too much fun. One of the less obvious things that gave this car away was the employment of disc brakes on all four wheels. They were sharp and didn't feel reluctant as they brought the car to a standstill the instant a local bus came charging around a blind corner. Although this car lacks the Abarth frills all around, the version that hits the showrooms will get new colour schemes with decals and Abarth's scorpion logos. The Fiat badging seen on this car will be replaced by Abarth badges and the interior will get Abarth specific detailing with new upholstery. The production-spec car will get new 16-inch Scorpion wheels similar to the one on the Abarth Punto Evo, wrapped in 195/55 R16 tyres. The ground clearance on the Avventura Abarth is the same as the stock car at 205mm, which is a good 50mm higher than the Abarth Punto Evo. 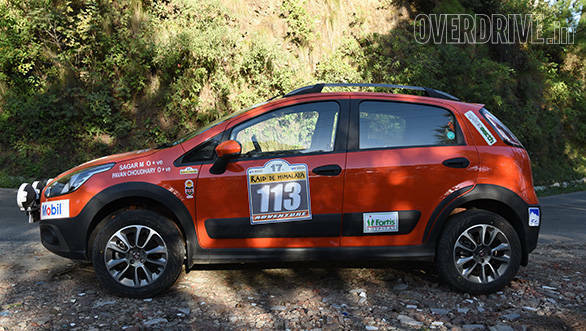 Overall, the Abarth Avventura is quite a sprightly little car and as I climbed up the hills of Shimla, the subtle growl from the engine just begs for you to push harder. And I did.